The Estimat-All program does what it’s name suggests. Estimating any material finish, whether by liner feet, square feet, square yards, pieces, walls, floors, ceilings, doors, corners, etc. Seam and Tile at any angle including 45 degree diamond tile layout. Brick and rectangular layout and custom grout widths. Visually center or align tile and seams to walls, doorways, and architectural features. Yes, Estimat-All does On-Screen takeoff utilizing PDFs, Tiffs and other file types. The Estimat-All program works like a spread sheet. Is very easy to learn and the fastest way to do take-offs. 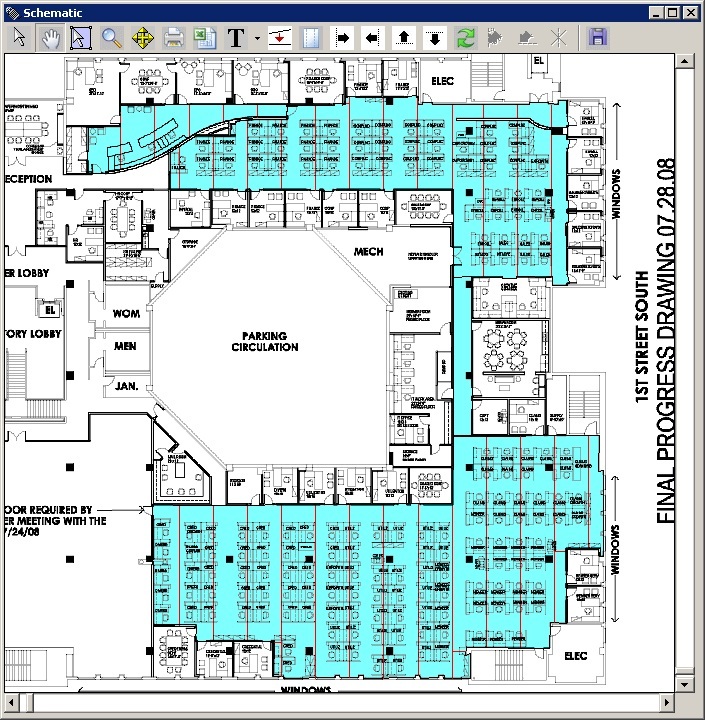 Working with any scale, including plans that have been photo reduced and faxed, Estimat-All can accurately quantify in any scale. Material quantities are calculated by clicking the mouse or digitizer cursor around any room or shape. Quantities are fed into the appropriate columns by Sq Yards or Sq Feet and Quantity of Pieces. Quantities are exported to our custom Microsoft Excel spreadsheet for pricing and proposals. All data is also available for use with your own custom solution. Call us today for an online demonstration!